Mickey Cohen: It’s like they say, all good things must eventually be burnt to the ground for the insurance money. It’s hard for me to accept that the first major studio release of the year, one featuring a bevy of big names no less, would also be a serious candidate for one of the worst films of the year. I’m not sure why it’s difficult considering how many times it has happened in the past, but when you see this much money invested in such a high profile project like GANGSTER SQUAD, you have to think that Warner Brothers must have put someone in charge who knew what he was doing. Instead, they put Ruben Fleisher in charge, a man whose directorial debut, ZOMBIELAND, can now officially be called a total fluke. 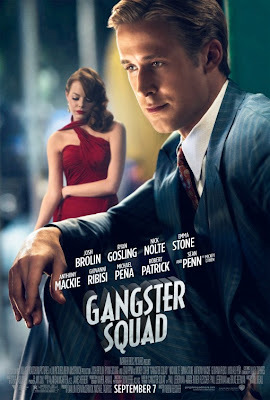 GANGSTER SQUAD is actually a complete joke of a movie, or rather it has to be viewed as one in order to make watching it bearable. Screenwriter, Will Beall, if you want to call him that, has composed a fictionalized account of how infamous gangster, Mickey Cohen, was taken down by an elite and highly top secret gang of super cops, who have banded together in their common goal to see a safer Los Angeles. They are also all post-war soldiers who don’t know what to do with all their misplaced aggression. And in keeping with the facile screenwriting tropes that Beall seems to believe are the foundation of a good genre picture, this band of not-so-merry men is made up of misfits, from a sharp shooter to a hot head to the brains of the operation. Only one of them has a family to worry about so you know exactly which one is going to die first. This is the kind of genius to his writing. Amidst all the predictable plot development and laughable dialogue, is Fleischer’s total mismanagement of said material. At times, I wasn’t even sure there was a director on set. If there was, I’m sure he would have told Sean Penn and Ryan Gosling to stop trying so hard all the time. Every element of their performances seems forced and rehearsed, without the smallest trace of organic humanity to them. I swear, even the way Gosling puts bacon in his mouth is calculated. That said, over doing it is better than not doing anything at all with your time on screen. I’m talking to you, Josh Brolin. Everyone is either good or bad here; actual character development and layering is not even a consideration. And Emma Stone as Penn’s love interest? That would be disturbing even if Penn’s make-up didn’t make him look like a corpse. Visually, GANGSTER SQUAD is all style over substance, but with very little trace of taste or ability. There is a brief allusion to the idea that there is little difference between the violence of the mob and the methods used by the squad to bring the mob down, which could give the film some sense of meaning and purpose. Then they take this concept and hammer it into the audience over and over again as character after character questions their moral involvement in the squad. There is only one way for this shell of a film to finish and that would be in a barrage of gaudy gunfire that takes out everything in sight. When the smoke clears, it’s pretty obvious that Fleisher should stick to comedies, if that. At least those are intentionally supposed to be funny. How many sheep would you give Gangster Squad?